Madge is a fan of found art and loves to repurpose the unexpected to hang on walls. She’d much rather frame a magazine than purchase an expensive painting. As an occasional feature she will be posting some money saving trick for decorating your home. 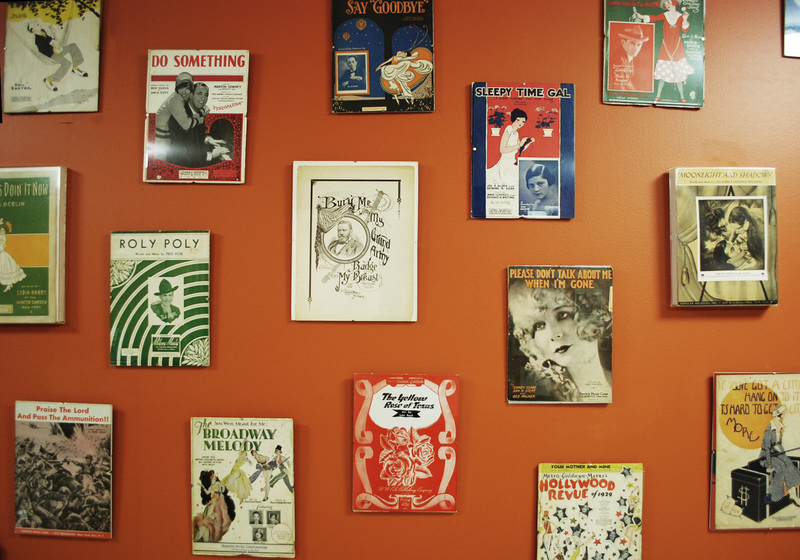 Today we are starting with Madge’s favorite type of art – vintage sheet music. Long before mp3s, records, TV or even radio, almost every home had at least one musical instrument. Many homes had several, most commonly a piano or violin. These instruments were actually played and sheet music sold just like top 40 singles. Even with the dawn of Edison disks, victrolas and 78s, sheet music was still king since it was much less expensive. 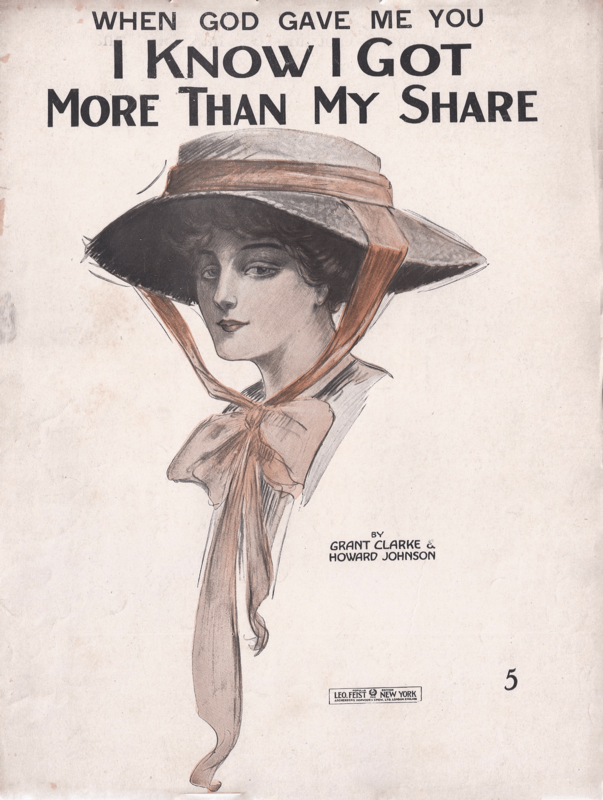 Sheet music had beautiful cover illustrations either expressing the theme of the music or featuring the star that made the song a hit. The heyday of this art form was from the 1880s to the 1920s when music publishers hired song pluggers to promote their music. Music publishers clustered on West 28th Street between Fifth and Sixth Avenue in Manhattan, an area of New York City that became known as Tin Pan Alley. In fact there is a plaque on the sidewalk on 28th Street between Broadway and Sixth in commemoration of that era. At the music store, customers could hear samples of the music, either on the piano or sung. In 1892 the sheet music for After the Ball sold over one million copies. It would go on to sell over ten million in the next few years. Here’s a recent addition to Madge’s collection featuring a lovely lady from V & J Duncan Maps and Prints in Savannah. Sheet music became less elaborate as records became more economical and gained in popularity. Still the sheet music of the 1930s – 1950s is still art-worthy, especially those with photos of stars like Frank Sinatra or Bing Crosby. Madge got the idea years ago to use this music as decorative art after she scored a huge pile of the stuff at an auction. Picking her favorites and hanging them on a feature wall, this collection has grown through the years. Now Madge rotates through the music every so often so the collection never looks the same. Sheet music varies in size but most pieces are either 8.5” x 11” or 9” x 12”. Madge uses Euro Clip frames, the ones with just glass and metal clips, come in the perfect sizes. These frames are inexpensive and found at craft chains such as Michaels. The see-through glass allows the music to float on the wall. Mixing sizes adds extra interest. Here are a few shots of the rec room music wall. Madge used a bright dark orange paint that makes the music really pop. So next time you are at an estate sale or flea market, see if there is a pile of sheet music for 50 cents or a dollar a piece and start your own collection. I love your choice of the clear frames that really allows the sheet music selections to pop! I frame vintage magazines and shadowbox antique and vintage purses as part of my home decor! The artwork on the sheet music for over the past 70 years or more is amazing. I grew up in a home that was really a step back in time. Raised by a grandmother that hung onto everything, sheet music was the “pop music” of the day. I learned to play the piano accompanied by “Stardust” and a few other moldy oldies…kinder gentler times for sure. 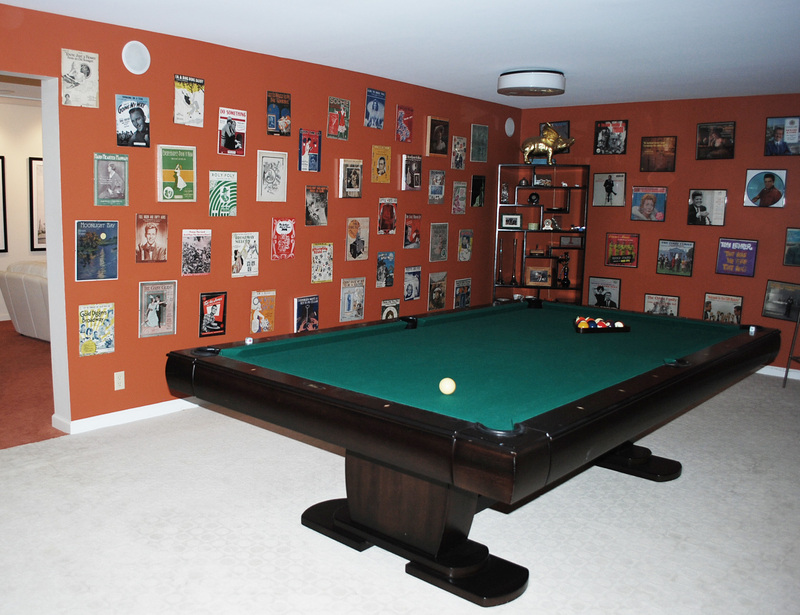 Good one Madge…I’d love to shoot a game of 8 Ball in that gorgeous “rec room”.